Los Angeles, CA, USA; Los Angeles Lakers head coach Mike D'Antoni in the second half of the game against the Minnesota Timberwolves at Staples Center. The Lakers won 104-91. Los Angeles Lakers coach Mike D’Antoni was a real Grinch, and now he says he’s sorry. Following a loss at Phoenix on Monday, D’Antoni delivered a message to Lakers fans who may be feeling a little discouraged. "If they’re discouraged, then find another team to root for," he told reporters in Phoenix after a 107-90 spanking. "We’re not going to give up. Are you kidding me? Discouraged? That’s not even fair to these guys." Not surprisingly, Lakers Nation quickly fired back via message boards and social media. But after getting the chance to sleep on it, D’Antoni issued an apology on Christmas Eve. "I was an idiot last night," he said after the Lakers’ light practice Tuesday. "I was out of my mind. I was ticked off. We didn’t play well â¦ so I said some stuff I shouldn’t have. That’s me. I just made a mistake." The Lakers have slipped into a two-game losing streak and stand at 13-15 overall. They host the Miami Heat on Christmas Day. They’ve suffered an array of significant injuries — most notably to star guard Kobe Bryant, who returned from a ruptured Achilles only to fracture his knee after just six games. Bryant is expected to miss at least five more weeks. Steve Nash (back), Steve Blake (elbow) and Jordan Farmar (hamstring) have also missed time, leaving the Lakers without a point guard to run the team. Given all that, a lot of folks around the NBA think the Lakers should actually be applauded for staying around .500. 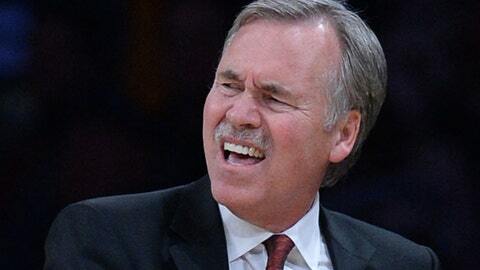 "We’ve got a team that is overachieving," D’Antoni said. "We have a lot of injuries and we’re in a tough state right now. We need everybody to be pulling with us. It’s going to take the whole village to get this done. That was the meaning, I just said it wrong. It came out wrong because I was agitated. I apologize." On the bright side, Farmar is expected to return Wednesday and forward Pau Gasol appears to be in good health following an upper respiratory infection. "We need everybody to be behind these guys," D’Antoni said. "They’re going to play as hard as they can play." * Guard Nick Young has been an underrated bright spot. Young was signed by the Lakers as a free-agent this past summer and has scored in double figures in 14 straight games (all off the bench). As a reserve, Young is averaging 17.2 points. We’re getting hit from all types of different angles and there’s not much we can do about it. * Young said the Lakers took a little bit of step back against the Suns. "We ain’t got no point guards out there," he said. "We’re getting hit from all types of different angles and there’s not much we can do about it." * Young speaks the truth, as D’Antoni has used 13 different starting lineups heading into the Miami game. Most of that has been because of injuries. * Through 28 games, the Lakers were 9-1 when leading after the third quarter, and 9-3 when limiting opponents to less than 100 points. 1. According to a report by Grantland.com’s Zach Lowe, the NBA is considering a proposal that would eliminate the draft lottery. Lowe reported the proposal involves a "wheel" that would predetermine the draft order each summer — with each team receiving the No. 1 pick every 30 years. No more "tanking" or protecting picks. 2. Brooklyn GM Billy King on how the Nets will go about replacing center Brook Lopez, out for the season with a foot injury: "If there’s a deal out there that we feel will make us a better team, we’ll do it, regardless of the tax or the future. But we’re not going to panic and do a move just to make one. I still believe in this group." 3. The Indiana Pacers are in first place in the East with a payroll that’s just less than $70 million. The Nets are one of the league’s biggest disappointments and are paying around $80 million in luxury tax. 4. Undrafted rookie guard Seth Curry has signed with the Memphis Grizzlies. Curry is the brother of Golden State Warriors sharpshooter Stephen Curry and the son of former NBA guard Dell Curry. Seth Curry had been playing for the Santa Cruz Warriors of the NBA D-League. 5. Former University of North Carolina guard P.J. Hairston recently took in the Charlotte Bobcats-Milwaukee Bucks game to watch former Tar Heels teammate and current Bucks big man John Henson. Hairston was suspended by North Carolina and will not be reinstated. Reports suggest Hairston could make himself eligible to play in the D-League after the holidays. 6. Atlanta Hawks swingman Kyle Korver’s NBA-record streak of consecutive games with a made 3-pointer is at 97 entering Thursday’s game at Cleveland. 7. Shaquille O’Neal attended the Sacramento Kings’ home loss to the New Orleans Pelicans on Monday. The former star center is now a minority owner with the Kings. He sat courtside, next to Kings majority owner Vivek Ranadive and Hall-of-Fame guard Chris Mullin, who works in an advisory role with the team. 8. The Orlando Magic are 0-14 when allowing opponents to score 100 or more points.